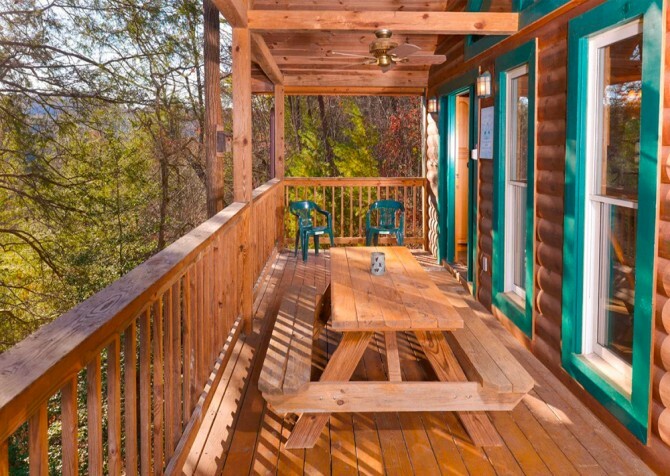 Located conveniently less than 8 miles from the downtowns of both Pigeon Forge and Gatlinburg, Blue Mist is a cozy 1-bedroom Pigeon Forge cabin that’s ideal for a romantic getaway. The lovely log exterior is trimmed with unique green details, and the interior features comfortable spaces and furnishings. Secluded in the scenic Smoky Mountains, this cabin offers the peace needed for a honeymoon, anniversary trip, or romantic escape. If you’re traveling with more than two, a sleeper sofa offers additional sleeping accommodations. As you relax here, enjoy the conveniences from home and the comforts of a Smoky Mountain vacation rental. You’ll feel right at home when you step inside the charming living room of Blue Mist. A comfy matching sofa and chair, along with a glider, sit in front of the inviting gas fireplace. On those cool mountain evenings, gather here with the one you love. You can read beneath a lamp as you sit in the glider, play board games or card games on the stone coffee table that sits over a large mountain-themed rug, or just kick up your feet and watch TV. The many windows will let the sunlight stream in on those sunny days, and the soaring ceilings with exposed wood beams make the room feel spacious and open. There is plenty of seating for a couple or small family, and the bathroom is conveniently located just off of this room – easily accessible from the bedroom, kitchen, dining area, and living room. Great for cooking meals in the cabin or having snacks on hand, the fully equipped kitchen in Blue Mist features full-size appliances – an oven, dishwasher, microwave, and refrigerator – and lovely light cabinets. Cooking in the cabin is a great way to save some money on vacation, and it will give you a chance to spend some extra quality time with that special someone. Whip up your own meal or order our romantic dinner for two – the ingredients, including candles, potatoes, steak, salad, and flowers, will be waiting in the cabin for you to cook and enjoy. In the kitchen, you’ll also find conveniences such as a coffeemaker, toaster, blender, and knife set. If you don’t want to do your own cooking, use the kitchen to keep leftovers from some of the great restaurants downtown. Whatever you use the kitchen for, you’ll find plenty of conveniences at your fingertips. The dining area of Blue Mist is located in the kitchen and is set for 4 – perfect for a family meal or a romantic candlelit dinner for two. It’s open to the living room, so kids can watch cartoons as they eat, or you can visit with those in the kitchen and living room. The wood dining table sits over a Southwestern-style rug, adding some extra warmth to the room. When you don’t want to drive downtown, enjoy peaceful meals in this charming dining area. You can stock the cabinets and refrigerator with local goods and ingredients from the farmers market or a nearby grocery store, and you won’t even have to leave the cabin when you’re hungry. Couples will appreciate the peaceful retreat the bedroom in Blue Mist offers. With a comfortable king-size bed and stylish bedding, the master retreat offers a good night's sleep. Nightstands with lamps sit on either side of the bed, and a log dresser adds a touch of mountain charm to the room. In the morning, wake up to the natural sunlight flowing in through the many windows. The room feels cozy but spacious, with high ceilings making the room feel even larger. When you want some time to yourself or with that special someone, sit back with a drink in the rocking chairs, or look out the window and take in the beauty and serenity of the mountains. The master bedroom also boasts a jetted tub set behind a half wall for privacy. You can hang your towel or robe on the hooks, keep bath essentials easily accessible on the log side table, and hop in the tub for a relaxing and romantic bath. Want to make it even more special? Add one of our gift baskets that are filled with everything you need for a relaxing bath – a book, candles, candy, bath salts, and more. If you're traveling with kids, they'll love bath time here – just don't forget the bath toys! The large tub with a tile surround is perfect for letting kids play their favorite bath time games. Just outside the bedroom, the bathroom is easily accessible for all guests. The bedroom even offers easy access to the deck, where you'll find a hot tub waiting. An important part of a visit to the Smoky Mountains is enjoying the great outdoors. At Blue Mist, the outdoor spaces are also impressive. They feature an open deck and covered porch with lots of room to unwind and relax. Take in the beautiful wooded surroundings and breathe in the fresh air as you soothe tired muscles in the hot tub. You'll find romance and relaxation as the sounds and sights of the Smokies wash over you. On the other side of the cabin, the covered porch provides a place to enjoy the outdoors regardless of the weather. Have a cup of coffee as you sit in the deck chairs or enjoy an outdoor meal at the picnic table. The memories you make here will last a lifetime. Blue Mist boasts even more amenities, giving you plenty of conveniences during your stay. Bring your favorite music to play on the CD player, pack romantic comedies or the kids' movies to watch with the DVD player, or just enjoy the slower pace of the mountains in your secluded cabin. If you're planning a romantic getaway, this secluded cabin is just the place. And although Blue Mist is secluded and peaceful, it's also not too far from downtown Pigeon Forge and downtown Gatlinburg. “Meet” your favorite celebrities from today and yesteryear at this Pigeon Forge attraction you can't miss as you drive along the Parkway. Impressively detailed wax figures are posed in TV and movies scenes, and you can hop right in for a photo! There is even a horror section that adults and older kids will love. Work your way through a maze of mirrors and LED lights at this Gatlinburg attraction along the Parkway. At the end of the challenge, find Ripley’s Candy Factory – a candy lover’s paradise! Whether you want to shop, eat, or play, downtown Pigeon Forge has it all. There are many unique shops, including As Seen on TV, a knife warehouse, and a shop completely devoted to dolls, and the Tanger Outlets down the road offer great deals on brand-name merchandise. You’ll also have your pick of dozens of restaurants, or you can check out the many family-friendly attractions.